How have you all been? It has been ages since my last post! I have been quite busy with college and a bit out of it lately. I am also preparing for my internship application for the next semester that keeps me a littl, if not a lot insane! It has been a while since I last posted an ESthetic post so let's take a break from the EsTrails posts and I have this ESthetic/beauty related post for you beautiful earthlings! I was contacted by Cutencuterfactory.com to be an affiliate and if I wanted to do a sponsored review. Though I was slightly hesitant with sponsor reviews, I gladly accepted with the conditions saying that I will still be truthful in my review and the Cutencuter Company agreed. I will get into the review part of this post towards the end. For now, here's a little haul! This was what the boxed looked like when I opened it. 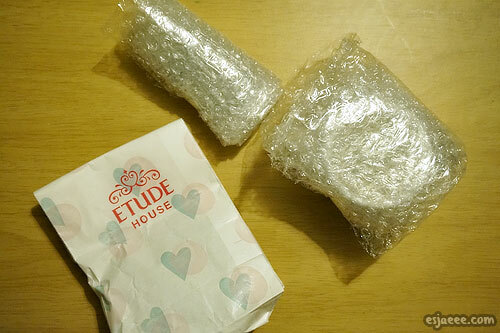 I was delighted to see that the products that I ordered were wrapped in bubble wrap. These were the items that I got. 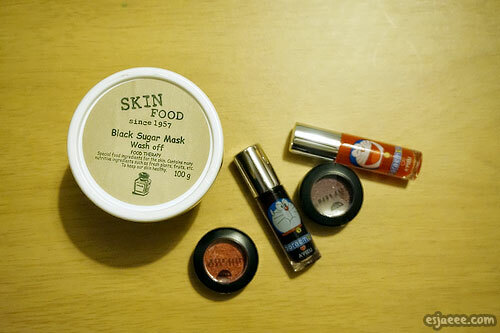 I have been eyeing out Skinfood's Black Sugar Mask since it was raved by a lot of beauty Youtubers/bloggers! It was on sale ($9) when I got it. I also ordered Aritaum's Mono Eyes in Jack Burgundy, Soft Berry and Italian Job. Unfortunately, I did not receive the Italian Job. (I will discuss this more into detail towards the end of this post). I purchased on of the eyeshadows with my own money and the two lip tints by A'Pieu. The packaging was the one thing that got my attention with these lip tints! A'Pieu released a Doraemon edition lip tints and I could not resist the packaging. I got the one in Plum and in Apple. I also enjoyed these bunch of free samples they gave me! Even though they do not sell Etude House, they still managed to give me samples since they knew how much I love the brand. 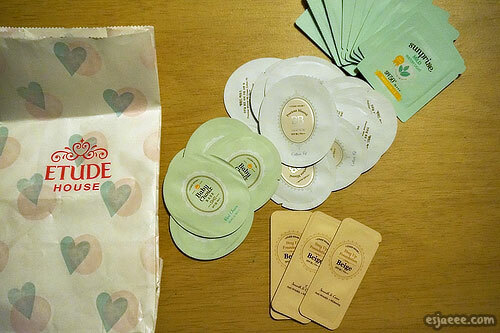 I was given a voucher by CutenCuter Company for me to purchase any products that I wanted. I also added some products that I purchased with my own money (which was one Aritaum eyeshadow and two A'Pieu lip tints). I ordered the items on September 15th and they were shipped on September 21st. I finally got the package on October 6th. 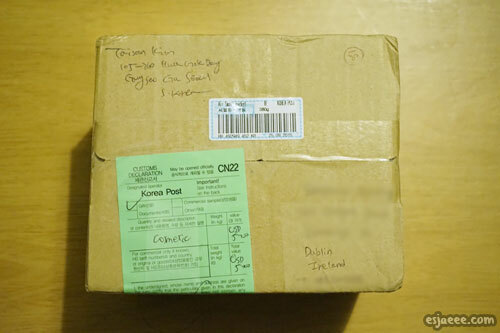 It took 15 days for me to receive the package after it was dispatched from South Korea. I also paid $3 for tracking number and it took about 5 days for the package to be cleared from customs. I was kinda over-expecting for me to receive the package in around 2 weeks but I also knew at the back of my head that it would take a minimum of 25 days for me to receive the package since they just use the standard Korean post. My package came in a box with my address on it as well as Cutencuterfactory's. It also had a customs' sticker. I was delighted that they have labelled my package as a gift. This would definitely help me in terms of not paying custom duties. (Bad, I know). I was kind of upset that one of the eye shadows that I ordered was missing from the package. I informed them this but somehow the message was not received the first time, but on the second time, I got a response saying that it will be included in my next order since they cannot deliver to Ireland at the moment. One of the positive things about Cutencuterfactory is their customer service. The staff is really nice and responds to your queries. Even though shipping took long, it was free. I was not very happy the fact that I had a missing item in my package, I would suggest for Cutencuterfactory to include invoices in the orders to make sure that none of the items are missing. The question is this, would I order from them again? Yes, that's if I had the money! They offer a range of high end Korean products that I really want to try soon! That's it for me for now! I hope you enjoyed this post and it is helpful somehow. I hope you all are having a wonderful week ahead!